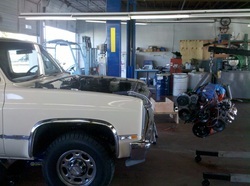 A customer came to us with a plan to upgrade his 1986 C20 Chevy Pickup engine. The engine that is currently in the truck is the original Small Block Chevy with a carb. Smog compliant, but very slow. The engine to be installed is a black widow marine engine (373 or 383 CID, we aren’t quite sure yet) that has been built but sitting on a stand for the past two years. Plenty more to come on engine details. Finally, the money and the time have come together to make this project happen.